The important thing about The Important Book -- is that you let your child tell you what is important about the sun and the moon and the wind and the rain and a bug and a bee and a chair and a table and a pencil and a bear and a rainbow and a cat (if he wants to). 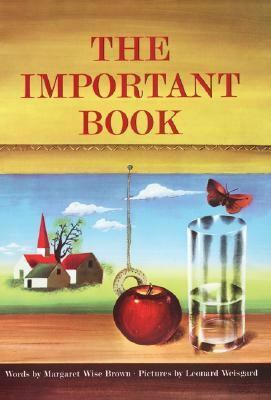 For the important thing about The Important Book is that the book goes on long after it is closed.What is most important about many familiar things -- like rain and wind, apples and daisies -- is suggested in rhythmic words and vivid pictures. 'A perfect book . . . the text establishes a word game which tiny children will accept with glee.' -- K.Brown, Margaret Wise is the author of 'Important Book' with ISBN 9780060207205 and ISBN 0060207205.